I am launching this blog–auspiciously, I hope– on the day that the first copies of my new book, Having it All in the Belle Epoque, landed on my doorstep. The book explores images of modern femininity promoted by the first two women’s photographic magazines in France, Femina and La Vie Heureuse. 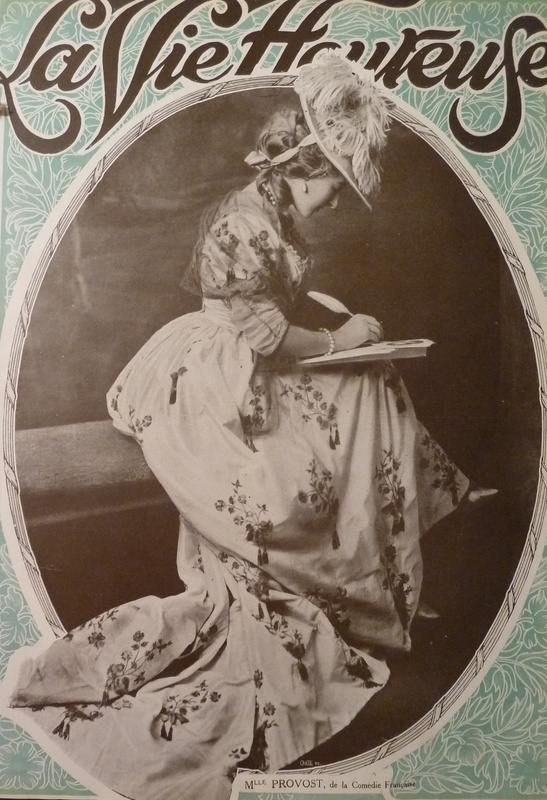 In the course of my research, I found that these magazines, launched in 1901 and 1902 respectively, were endlessly fascinating in their early efforts to balance femininity with feminism. But they were also at times breathtakingly gorgeous, and at other times, just plain hysterical. As I pored over their pages, I often found myself exclaiming aloud in wonder. Stanford University Press allowed me to include over sixty images in the book, but there are so many more worth sharing. As I gather more and more copies of these Belle Epoque beauties for my personal collection (thank you eBay.fr! ), I continue to make discoveries–surprising, funny, visually stunning. Twenty-first-century academic that I am, I decided to launch Plus ça change…, so that I could marvel over these fun finds in good company. The cover of my book features (beautifully, I might add– thank you Stanford UP art department!) a 1911 cover of La Vie Heureuse with “Mademoiselle Provost” of the Comédie Française. I love how her elegant attire and dramatic silhouette work in harmony with the act of writing itself: the feather of her plume an extension of her feather-filled hat, as if her very accessories represent endless creative possibilities. The image above is of the original magazine that my cover is based on. As for the title of the blog, it is of course from that great French expression (which, apparently, is rarely used in French, but no matter) Plus ça change, plus c’est la même chose (the more things change, the more they stay the same), and it’s been my constant refrain in exploring early images of work-life balance. You can see more in this slideshow that I did for Slate in September, or if you prefer the French version.